According to the Clash of the Titans report released in 2014 by Panorama Consulting, there are differing quantitative dimensions when it comes to implementation of ERPs (Panorama-consulting.com). 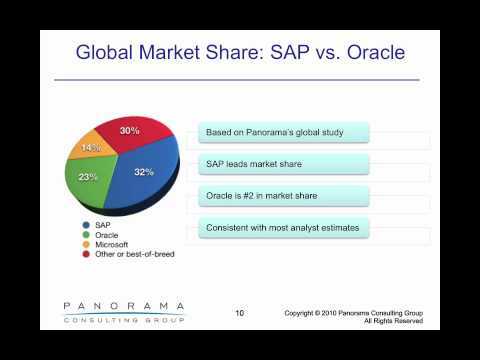 Customers of SAP and Oracle depict differences in the choice and preference of their products. On one hand, the statistics revealed that Oracle customers save more on implementation as opposed to SAP users. However, the advantage of SAP lies in its ability to deliver within the shortest time and in line with the projected implementation period. Based on the diversity and differences prevalent in the two products, five critical areas are of concern. They are risk of implementation, cost, and duration of implementation, functionality and customizability, cloud adoption and scalability (Krigsman and Krigsman). The risk application profile tends to be higher for SAP than for Oracle. However, in an effort to reduce the risk, SAP provides an all in one product feature that covers best pre-configuration and practices in the industry. The aim is to reduce the risk and enhance implementation. Oracle achieves this through an implementation of a user productivity kit and accelerators. When it comes to ownership, the average SAP customers pay up to 4% on the annual revenue in owning the ERP while those of Oracle pay for only 1.7% (Kimbeling). The cost is highly dependent on the functionality of the software where SAP promises a more wide feature as opposed to Oracle. The two software packages excel when it comes to functionality and customization. SAP comes bundled with tools for enhancing quick implementation and improving the end users experience (Centriqs.biz). Oracle does not fall short of this requirement as it strives to meet the needs of the users through an efficient design. When it comes to choosing which resource program to adopt, the business needs to become paramount. The support and efficiency of SAP make it more powerful with little implementation time, customizability, and real-time tracking and data management (Kimbeling). However, for a small business, Oracle is more efficient as it offers a more affordable technology with a 30-day risk-free trial period. Centriqs.biz,. 'Enterprise Resource Planning Software: SAP Vs Oracle Comparison'. N.p., 2015. Web. 22 Mar. 2015. Kimbeling, Eric. 'SAP Vs. Oracle: Who Comes Out Ahead?'. SearchSAP. N.p., 2015. Web. 22 Mar. 2015. Krigsman, Michael, and Michael Krigsman. 'ERP Implementation Benchmark: Comparing SAP, Oracle, And Microsoft | ZDNet'. ZDNet. N.p., 2012. Web. 22 Mar. 2015. Panorama-consulting.com,. 'Clash Of The Titans 2014: An Independent Comparison Of SAP, Oracle And Microsoft Dynamics |'. N.p., 2015. Web. 22 Mar. 2015.